The earliest photographs of Abraham Lincoln show him in his thirties. 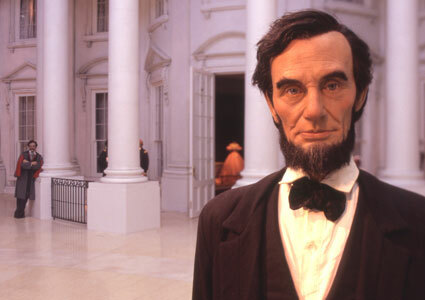 The Museum designers wanted to accurately present Lincoln three dimensionally, not only in his thirties and older but also at earlier ages, for the immersive exhibits. The Lincoln Library committee of historians recommended reference photographs. BRC had a concept artist/sculptor develop dozens of detailed facial studies of Lincoln based on those photographs. To uncover the young Lincoln, he defined key features and subtracted the effects of aging. These were then used by artists to create life-like figures of Lincoln at various ages. The same process was also used for all the realistic figures within the exhibits.